Ya, pretty much just the beer selection at a local Mini market. After blogging from Starbucks I headed back to the hotel to dump off my bag and head back out with Mel. We didn’t really have a plan other than finding a fun little lunch spot. We re-traced my previous walking tour and found a decent place. After lunch we headed off towards a TripAdvisor recommended place. The John Lennon Wall. But first, a random picture of something. The John Lennon Wall was pretty colorful. It was also a wall. Yep, a colorful graffiti wall. 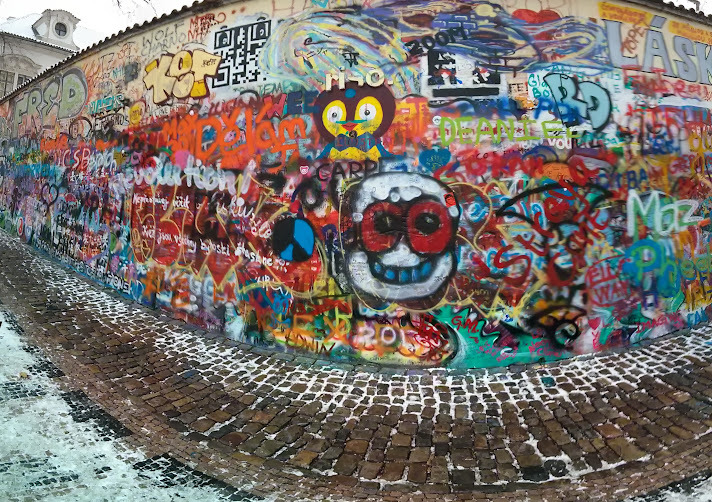 Photosphere of John Lennon Wall. Finally a picture of Mel and me. Mel has been suffering from some allergies and a wonderful cold/flu. What a trooper she is, but we must take our 5pm nap. What does that mean though? Of course, then we wake up and explore more! But, before nap time I run out and grab us something I saw the day before. 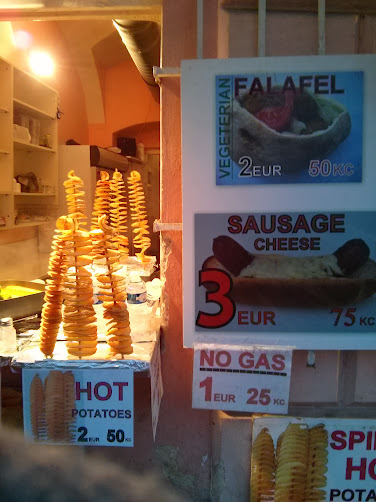 Haha, I guess swirl cut deep fried potatoe? Also, of course, sausage with cheese for a good healthy snack. 8pm. Dinner time. Perfect. Off we go! A short walk and a random place later, we find a goofy restaurant with a table glued to the ceiling. 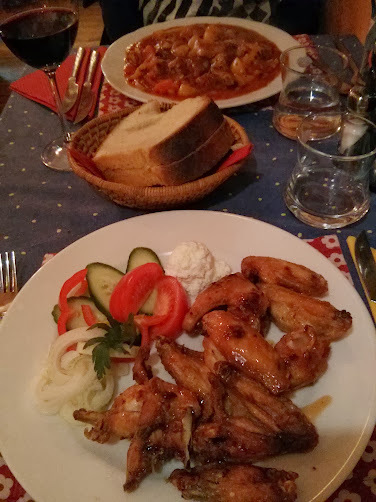 Food is pretty good too. Afterwards we seek a place to have a drink and talk. We passed a place that looked interesting, but not too sure about it. Small door with some candles along the railing of some steps that lead down. Door says open, but looks scary. I tell Mel it looks exactly like the place that she would love, but we keep walking in search of a place. Apparently because we are in the off season, not too many places stay open. We walk up a street for a place that Google Maps said was there. Closed! Back down and around. Nothing but some very full Irish pubs. I tell Mel that I think we should go back to the place that was downstairs so we head there. So very glad we did! Turns out it is a little Cognac cellar that is super cozy. Mel and I don’t even know what Cognac is at this point. I guess it is a type of brandy made from grapes that come from the Cognac region of France. I guess it is pronounced, Co-niac. Tastes very similar to whisky. I’m pretty much sold on the stuff after the first taste. We had initially gone here because I thought it would be a wine place that Mel would really enjoy and I would just have a beer or something. Instead we both enjoy it immensely. Afterwards we headed back to the hotel for bed time. Pretty fantastic day. 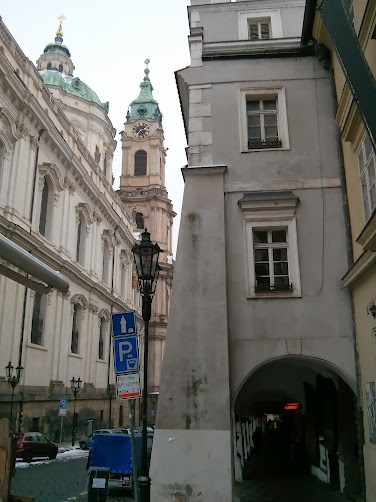 Tomorrow we will switch from our hotel to a rented apartment for the duration of our stay in Prague.